Share the post "5 Reasons Why Your Business Needs Contact Relationship Management"
The concept of CRM is not new. It has been an essential sales and marketing enabler for many years at a corporate level. But if you are the owner or manager of a smaller business, you may consider CRM to be unnecessary. You may take the view that a CRM system only makes sense if you have a large turnover, or a dedicated sales and marketing team who would use the complicated functionality. Perhaps you worry that the return wouldn’t justify the investment for a smaller business. Regardless of your concerns, CRM systems play a critical part for any small or medium size operation – but you should consider the ‘C’ in CRM to stand for ‘Contact’ rather than ‘Customer’. By thinking of CRM as Contact Relationship Management, you will widen its meaning to incorporate every relationship your business owns. This means not only customers but all other stakeholders as well. By helping you manage all these relationships your CRM becomes the glue which holds your business together. Research shows that a fully utilised Customer Relationship Management system can increase revenue by 29%. I frequently see net profit increased by even more with the help of an efficient, bespoke Contact Relationship Management system, such as CapsuleCRM. What’s the Contact Relationship Management difference? The reason why investing in a Contact Relationship Management system makes such a huge difference for businesses is the return on investment when it comes to time, energy and cost. CRM offers an average return of $5.60 for every $1 spent. This statement is again referring to Customer, not Contact, Relationship Management. Imagine how this figure could be increased further with the help of an even more inclusive system! One of my clients increased her net profit by 40% in ONE year by fully utilising her bespoke CapsuleCRM – find out more in her Case Study. How much time do you spend looking for the phone number or email address of that interesting person you met at some point in the last few weeks? We’ve all been there – eventually deciding to ‘look for it later’ and kicking ourselves for not being better organised. We all have contacts from various sources that we need to keep track of. You may have bought lists in the past or keep a list of current clients in a spreadsheet. Perhaps you store all your contacts in Outlook or Google, or you prefer to have a stack of business cards on your desk. You have clients, suppliers, industry experts, networking contacts, club members, business coaches, friends and family, competitors and more. Each one should be kept structured, safe, and ready for when you need it. A cloud based Contact Relationship Management system will enable you to record contact details and set up follow-up tasks from anywhere, meaning you won’t have to waste time looking for that important phone number later. As well as making your life easier now, you will be well prepared for complying with the General Data Protection Regulation (GDPR) which is due to come into force on 25 May 2018. When you run a business, all jobs end up on your shoulders – even the ones that aren’t making you money. 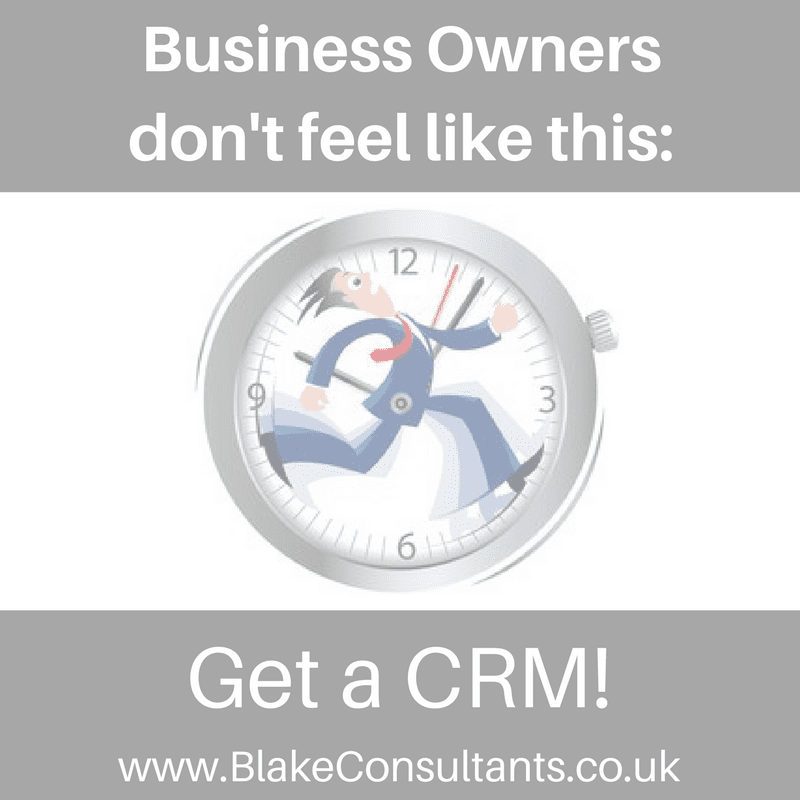 A CRM will help you run your business in a more efficient and organised way. It will free up your mind so that you can focus on improving the areas that will generate more revenue and help you grow your business. Wouldn’t it be great if you could get a quick overview of where opportunities are in the sales process at any given time? It wouldn’t just help you plan and manage forecasts; it could be an essential key to keeping your business afloat. A good CRM system will give you these insights at the click of a button. It will help you understand the actions required to convert a lead into a sale, and remind you to take those actions. It will give you insight into a client’s purchase history and enable you to guide them along the product staircase. This will all be reflected in the pipeline, making it easier to monitor and manage. Don’t get me wrong – I love spreadsheets, but they’re no good for keeping in touch with people. Not to mention the headache when it comes to managing various versions, stored in different places. 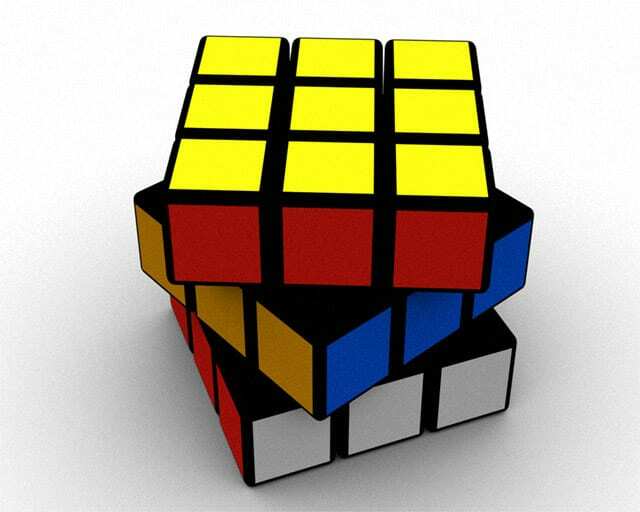 A good CRM changes a two-dimensional list into a three-dimensional interactive tool which can be played with like a Rubik’s Cube, allowing you to dice and slice your data any way you want. Being able to segment your data means you can send targeted marketing messages that will resonate with the audience, increasing the probability of people reading and acting upon them. Most of us will struggle to remember, in detail, what was said in the last conversation with a prospect or a supplier. Some days we can’t even remember what we had for lunch the day before, let alone recall one of the many conversations held in the previous week or month! Make life easier for yourself and get some CRM help. Simply keep a note of the conversation on the person’s record, and set up a task to call the person to follow up on the conversation – it’s as easy as that. A smaller business needs CRM as much as an enterprise does – but not the same one. An efficient CRM for your organisation is one that has been designed with you in mind. It needs to be flexible and able to reflect your business model and goals. When starting out with CRM, make sure you invest the time in thinking about how your processes work. Populate the system with clean and enhanced data and learn how to use it. Make the CRM system part of your day-to-day business life – allowing it to become the powerful glue that holds your business together. You never know – it could just be a life-changing experience for you and your growing business! I have been working with CapsuleCRM for over seven years and helped many clients increase revenue; reduce costs; make the most of their contacts; manage their pipeline; and deliver great customer service. I do this by designing and implementing CapsuleCRM to meet the client’s needs, offering a bespoke CRM to suit their business requirements. This makes CapsuleCRM a great solution for individuals and businesses of any size.